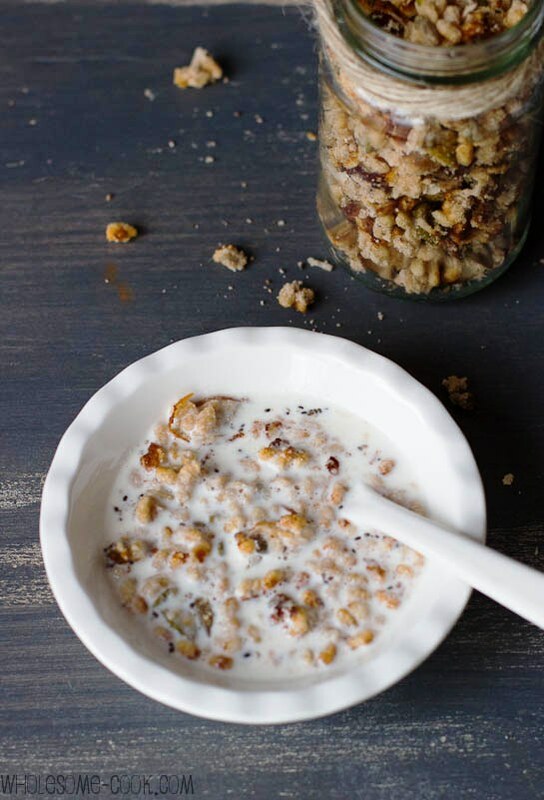 This easy Healthy Homemade Granola recipe is low in sugar and filled with wholesome goodness of nuts, seeds, and other crunchy bits to make for the most satisfying breakfast, or snack! It’s also vegan and gluten-free, just in case you were wondering. I had this fantastic idea to make super crunchy and out of this world good for you Florentines. Instead they turned out to be a super crunchy and out of this world good for you Granola! As the case is with a lot of making up recipes from scratch, they don’t always work the first time around. While my vegan Florentines came out of the oven promising and the raw version had set ok in the fridge, when I tried to dislodge them from the muffin tray I’d set them in, they crumbled and fell apart. It was 4pm I had been cooking all day and frankly I just didn’t have another Florentine attempt in me. I stared at the crumbled cookies, took a snap to Instagram some other time and thought: hang on a sec…this would make a fantastic granola! Packed with all sorts of natural and wholesome ingredients like almonds, pepitas, sunflower seeds, macadamias, pistachios and chia seeds. Sweetened with only a little rice malt syrup and a few organic sultanas for good measure, the addition of rice krispies adds the extra crunch. Awesomeness, I thought. And so, at 4:10pm I sat at my desk with a bowl of the crunchiest, most satisfying, no added sugar bowl of Granola I’ve had in… well, probably ever. I am glad the Florentines didn’t work out, because breakfast for the rest of the week has been that much better! Oh, and then I had another thought since I am trying to plan a wedding – this would make a perfect gift for the guests to take home, don’t you think? So tell me, dear reader, do you have days when you crave breakfast foods as a snack? Do you find more comfort in cereal or cooked breakfast foods? In a mesuring jug, whisk together wet ingredients. Pour wet ingredients into the dry ingredients bowl and mix well. Turn the granola out onto the paper-lined baking sheet and spread evenly around. Bake in a preheated oven for 10 minutes or until the granola has turned golden. 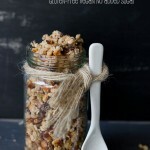 Store granola in an airtight container in the fridge pantry for 2-3 weeks. Enjoy on its own as a healthy snack, or serve with your choice of milk or yoghurt. YUUUUM! You must be one busy lady with the book and wedding planning! I love snacking on cereal so this looks great to me. And yes, a nice gesture to give something like this to guests. Love it! I am soooooooo making this! I love that you used coconut water! Great calorie saver!! Lovely granola! Great photography as usual! I just love coconut oil and the subtle flavour it brings to dishes. 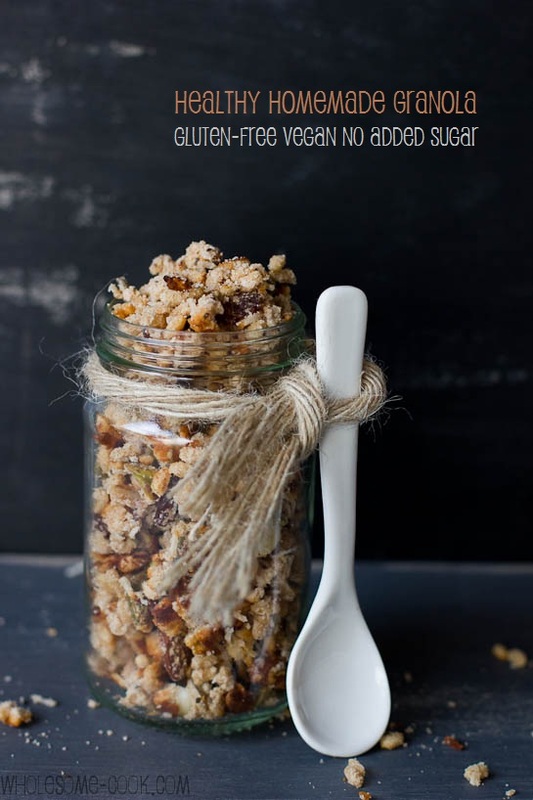 Great granola recipe Martyna. I just know this would be delicious! I have only had granola a couple times and fell absolutely in love. Thanks for sharing how to make your own. I definitely think I’ll be making a batch as I’m a bit of a health freak in the mornings…. Love the photos! Amazing. Great to hear Tina! Thanks for stopping by and your kind words. What a clever person .. waste not, want not! Absolutely delicious. By the way, the Cheesecake recipe is the best in the world. I have made it twice now, the first time with Italian OOO flour, the second with unbleached organic spelt flour, but the Italian was by far the best BECAUSE it was much finer and the pastry was so delicate. The spelt was rather heavy and stodgy. The filling is also scrumptious. I adore granola, I have it almost every day with yogurt and berries. Love making it at home, too, so your recipe is next in my queue! This would be such a great wedding guest gift. I am in love with home made granola at the moment and I look forward to trying your version out! Sometimes the best recipes are happy accidents! I love granola… and I love when things that don’t turn out as you planned actually end up being even better! I think this is a great wedding favour gift. Thanks Amanda! 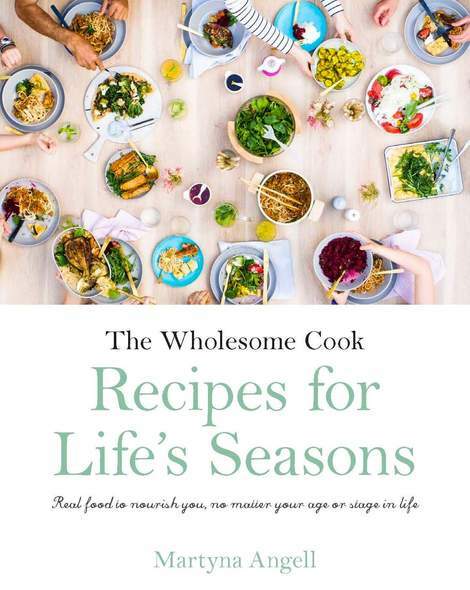 I might include it in the little “gourmet guestroom packs” I am planning. Your granola recipe sounds lovely. I have muesli every morning (week days) with natural yoghurt and honey. Thanks for sharing. 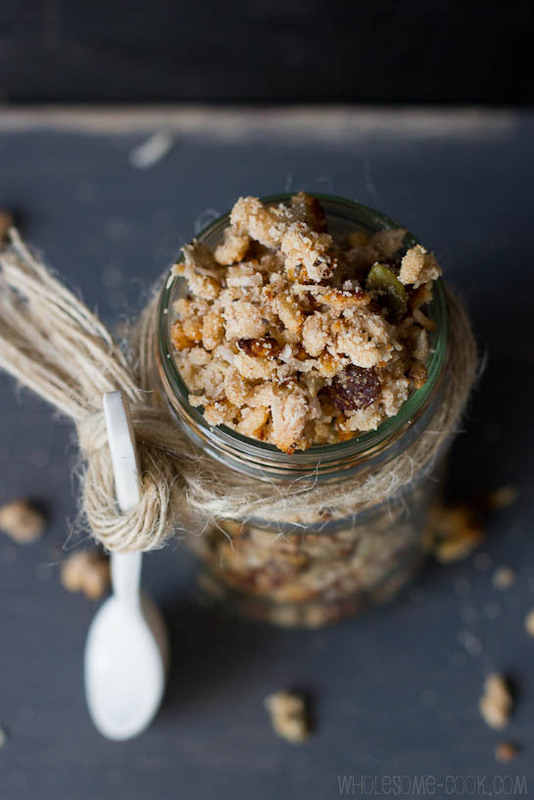 It looks like a good granola recipe, and giving some as a gift sounds like a good idea. Thanks again. Would love to try this but would like to see nutritional information. Wow amazing, we will definitely try this Martyna! Hi Ruth, great to hear you enjoyed it! Have a safe and merry Christmas! How many calories in 1/4 cup in this granola?